This Lizard is usually small, seldom exceeding six Inches in Length, the Head short, the Tail is blue, the rest of the Body brown; except that from the Nose runs five yellow Lines at equal Distances, along the Back to the Tail. They are seen often on the Ground, and frequent hollow Trees. Some People suspect them to be venomous, tho' I never heard of an Instance to confirm it. They are found in Virginia and Carolina. This Shrub grows usually to the Height of about ten or twelve Feet, the Branches grow with Bendings, at the Distance of two Inches from one another, at the Angles of which shoot forth its Leaves alternately, which in Shape are like those of the Bay-Tree, with very short Footstalks. The Flowers hang single on Footstalks, about an Inch long, and are composed of six Petal, viz. Three which are round and white, and three larger green ones, which are pointed, and cover the round ones: In the middle of the Flower appears the Ovarium, encircled with pappous yellow Stamina. The Flower when spread open is in Form of a Triangle: The Fruit is in Form somewhat like a Pear inverted, and as big as one of the largest Size, covered with a smooth green Skin, which contains a Pulp like that of an over ripe Pear; with many conic dark brown Seeds, placed at Distances within the Fruit. 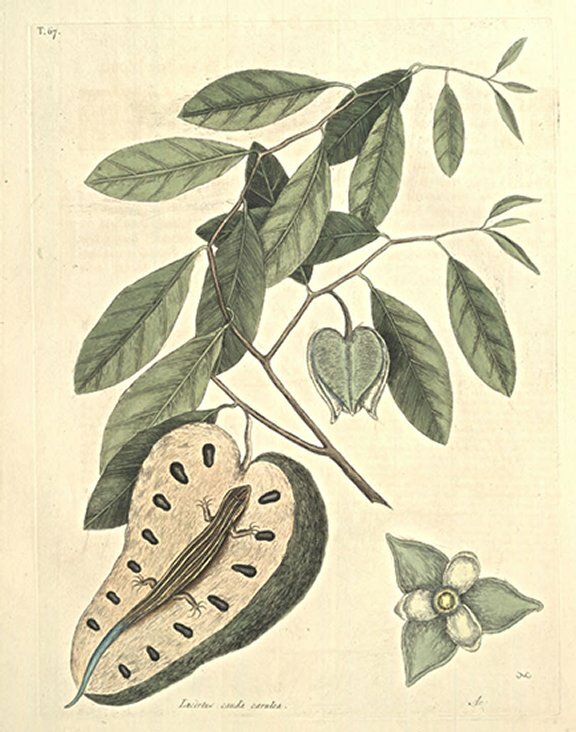 These, with most of the other Kinds of Anona, are Food for Guana's, smaller Lizards, and other Animals: These are Natives of Hispaniola, Ilathera, Andros Isles, &c, but no where North of the Northern Tropic. The Fruit of some of the Sorts of Anona have from their Taste obtained among the English the Names of Custard Apple, Sugar Apple, and Sowr Sops.